BRC: A crank forward that is mountain bike trail ready. 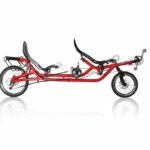 It’s fast and extremely capable on technical single track, while providing a more comfortable seat and ergonomics than a regular mountain bike. This is a capable mountain bike. 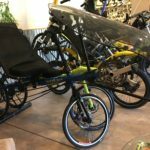 Rider reviews of both the 26 and 29 versions speak of not only of being on par with conventional MTB’s but having the added advantages of lower center of gravity, and longer wheel base. The lower CG adds to the ground hugging handling, and the longer wheel base enhances downhill. The chance of an endo is reduced; riders report more confidence, and speedier descents. My personal 29er has seen the aggressive trail rides in Colorado, where it performed flawlessly. I was impressed with the big wheels, and their ability to absorb shock. My rig had the straight fork, which I like, since it is 4 pounds less in climbs. The Alterra is built to handle all of your off-road adventures. 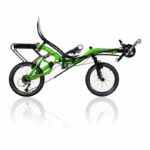 Its frame is handmade in America from7005 aluminum with agile-handling geometry made for twisty trails. The Alterra’s large-diameter frame tubes and awesome RockShox SID suspension fork with 80mm of travel are durable and trail-ready. 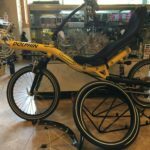 And, the Alterra’s crank-forward design offers superior comfort that’s also stand-and-pedal capable, a real asset on rolling terrain and technical trails. This upright riding position also prevents hand and wrist pressure and allows flat-footed starts and stops. Plus, this sweet bike features quality components from TruVativ and SRAM, and sure-stopping Tektro disc brakes. We have a test track out behind the factory. The track has challenges even for standard mountain bikes. At the 2011 RANS Rally we saw some impressive riding during the time trails on both standard mountain bikes and the 26, and 29 Alterra. On our double hair-pin turn there was less tapping by the CF riders than the standard MTB’s. Not a totally conclusive study but, observations show the potential of this bike.